BRAIN HEALTHY FOODS: Menus and Recipes has the essentials of a cookbook plus much more. 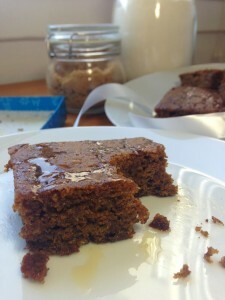 A bonus feature of our brain healthy desserts (8 pages!). Nutrition information for each day, meal and snack. Helps people maintain both brain and body health. Helps you achieve any weight loss or weight gain goals. (People with AD often lose weight that they don’t want to lose). MPN™ Guide to Sugars and Non-Sugar Natural Sweeteners section. This last section is as important as the menus and recipes, as people need to know how toxic sugar is to the brain and what we can do about it. All of the MPN™ recipes and snacks meet ADA and AHA guidelines. Thus in addition to people concerned with brain health, this book is wonderful and delicious for those folks who have diabetes and cardiovascular issues. All of these recipes are also suitable for children. 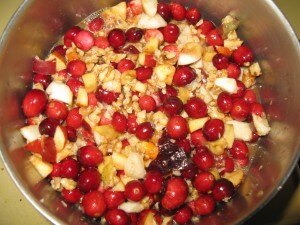 Brain Foods are especially important for pregnant and nursing mothers, and young children. 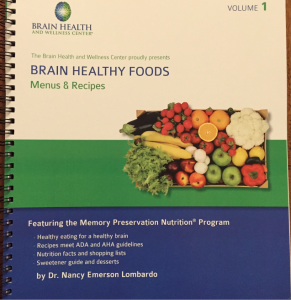 BRAIN HEALTHY FOODS: Menus and Recipes is a beginning guide to the sought after Memory Preservation Nutrition® program (MPN™), the brain foods program which is based on the latest science. This book will teach you about many scrumptious and tasty foods that help your brain as well as something about which foods hurt your brain. The book’s 35 Recipes include 8 Breakfast recipes, 7 recipes each for lunch and dinner, 2 snack, 3 salads, sauces and dressings, and 8 brain healthy dessert recipes. Plus 12 other snack suggestions that need no recipes. 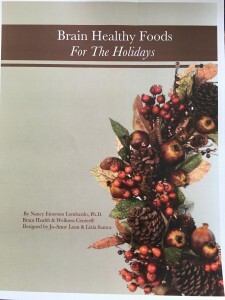 Brain Healthy Foods For the Holidays- 8 ½ x 11 Delicious Recipe Book New! 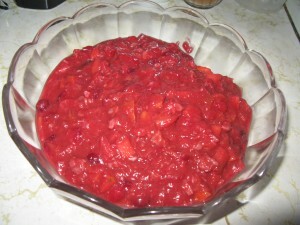 Photos of MPN Nancy’s Cranberry Nut Holiday Sauce, MPN Ryan’s Cauliflower Mash, and MPN Derrick’s Fish Endive Appetizer by Nancy Emerson Lombardo. This 50 page booklet authored by Dr. Nancy Emerson Lombardo and the Brain Health and Wellness Center® with the help of her food-loving colleagues, is chock full of delicious recipe and menu ideas perfect for planning holiday meals for your friends and families. Included are amazing appetizers and delicious decadent desserts for parties as well. Among the cookies featured are “Simply Divine” dark chocolate ones that melt in your mouth and an amazing scrumptious peanut butter cookie that is gluten free. These will help you be the stars of cookie exchanges. We’ve made sure there are delicious gluten free options in every category. TYPES OF RECIPES: There are 19 Vegan recipes and 13 Vegetarian among the recipes in this book. Appetizers, Entrees, Sides, Desserts, Beverages. At Holiday time we are sharing food with the people we care about the most – family and friends, as well as work colleagues and clients. 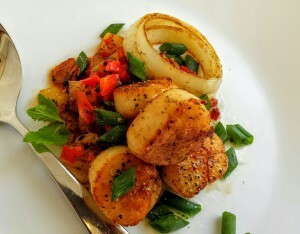 It is of course vital that all foods served are attractive and delicious, as we are treating our favorite people. Increasingly though, people are aware that what we eat, even at holiday time, affects how we feel, our mood and our brain power, even our pain levels, and will welcome being introduced to delicious foods that help, rather than hurt us. The extra bonus: less guilt and less extra weight in the New Year! The recipes contained in this special issue are from the evidence-based Memory Preservation Nutrition® program, and selected because they are not only delicious but easy to prepare. · Celebrating the delicious, healthful qualities of a full range of vegetables, fruits (especially berries), whole foods, including fish and seafood, nuts and seeds, beans and lentil, and whole grains. Description: Heavy Duty Card Stock covers with quality interior paper. Book is spiral bound so it lays flat on the kitchen counter. In full color. FULL SIZE: 8½ by 11 inches, which is easy to read and fun to use.